I still need artwork & window treatments, but this is probably all that will be done before she comes home. The big “moon” above her bed is still up for debate. The plan was to put her monogram inside, but that’s hard to do without a name!! Right now I don’t like it, so we’ll have to see what it looks like after the monogram & then it will either stay or go. My goodness, my baby girl will be ONE in just three months. At this rate, she’s going to outgrow her room before I get it finished!! And let’s not even get started talking about framed pictures & baby books. Because if we did, I’d have to admit that she’s only in one framed picture in the entire house & that her baby book is a far cry from a baby book. So, please help me feel better & tell me what you procrastinate with (especially if it’s as long as I!! ), or just leave me some comment love & tell me I’m horrible for still not finishing her room!!! In between stuffy noses, fevers, & ear aches, Megan’s been a very good sleeper. Of course to me that’s a little relative because Evan was & is anything but a very good sleeper. But she typically sleeps about 8hrs and then goes back down for another 2. However last night instead of going down for another 2 she decided to wake up at 2 & not go back down! It was not a fun night to say the least. Today – confirmation of what I was afraid the fist in mouth, constant drooling, and pure fussiness meant – today, I felt a baby tooth!! I mean really, now – this early? I know it’s possible & probably even common but don’t you get a break this first year at all?? I guess it’s true about forgetting the bad stuff, because I forget how bad Evan’s teething was … and I’m just talking about for me!! Poor little girl is miserable!!! So needless to say, I’m off to bed. To bed I said! But here’s one recent picture just for fun! Or at least that’s what the Ultrasound Dr says:) She seems to be very, very, very active already … there definitely isn’t a surprise baby hiding behind her that’s for sure!! And once I start feeling her move more, I don’t think I’ll ever get any sleep!!! But she’s right on track & seems to be very healthy with a strong heart beat!! One extra bonus is that she was measuring a full 10 days early & while I’m not getting my hopes up, it would definitely be a plus considering our weather in August/September!! 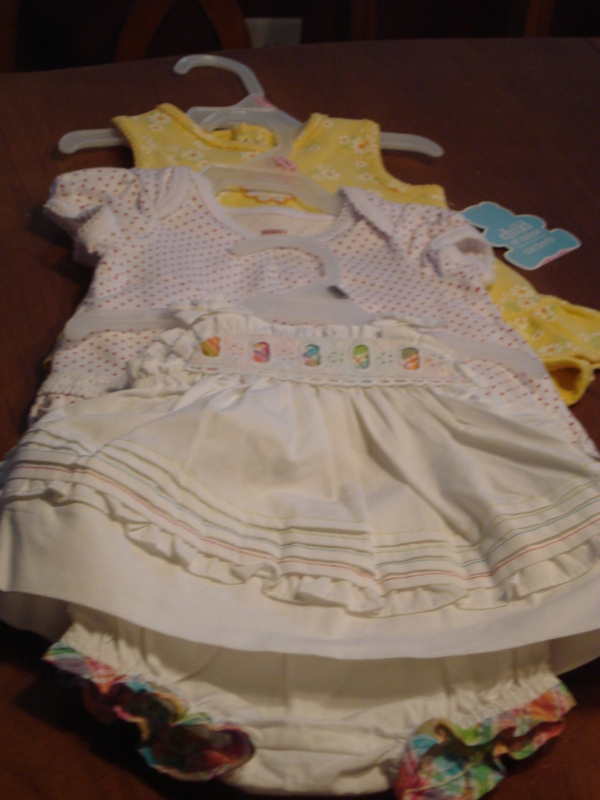 She already has a few outfits to hang in her closet courtesy of her “Nana”.